an immunoglobulin molecule having a specific amino acid sequence that gives each antibody the ability to adhere to and interact only with the antigen that induced its synthesis. This antigen-specific property of the antibody is the basis of the antigen-antibody reaction that is essential to an immune response. The antigen-antibody reaction begins as soon as substances interpreted as foreign invaders gain entrance into the body. See also immunity. Abbreviated Ab. 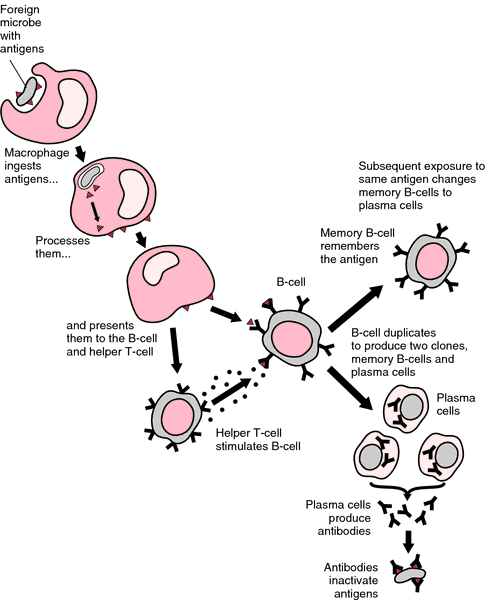 Antibodies are synthesized by the plasma cells formed when antigen-specific groups (clones) of B lymphocytes respond to the presence of antigen. The developmental process of antibody production begins when stem cells are transformed into B lymphocytes; this transformation usually is completed a few months after birth, at which time the lymphocytes migrate to lymphoid tissue primarily located in the lymph nodes, although they are also found in the spleen, gastrointestinal tract, and bone marrow. Antibody production, its interaction with a specific antigen, and the activation of complement (C), an interrelated group of eleven proteins, are the major components of the humoral system of immunity. Antibody-mediated immunity. From Applegate, 2000. Antibodies can be classified according to their mode of action as they react to and set about defending the body against foreign invaders. Some cause clumping together of bacterial cells (agglutination) and are called agglutinins. Those antibodies that cause bacterial cells to dissolve or liquefy are called bacteriolysins. This activity is assisted by complement, which interacts with the antigen-antibody complex in such a way that the cell ruptures and there is dissolution (lysis) of the cell body. Opsonins coat the outside of bacteria, making them more attractive to phagocytes. Other types of antibodies include those that neutralize the toxins of antigens (antitoxins) and those that cause precipitation of antigens in a fluid medium (precipitins). anaphylactic antibody a substance formed as a result of the first injection of a foreign anaphylactogen and responsible for the anaphylactic symptoms following the second injection of the same anaphylactogen. antinuclear a's (ANA) autoantibodies directed against components of the cell nucleus, e.g., DNA, RNA, and histones; they may be detected by immunofluorescence. A positive ANA test is characteristic of systemic lupus erythematosus. Antinuclear antibodies also occur in patients with rheumatoid arthritis, Sjögren's syndrome, and scleroderma. blocking antibody any antibody that by combining with an antigen blocks another immunologic reaction with the antigen. Immunotherapy (hypersensitization) for allergic disorders induces in most treated patients IgG blocking antibodies that can bind the allergen and prevent it from binding to cell-fixed IgE and trigger immediate hypersensitivity; thus it can induce partial immunologic tolerance. Blocking antibodies can prevent agglutination in serologic tests. complement-fixing antibody antibody (primarily IgM and the IgG subclasses 1, 2, and 3) that activates complement when reacted with antigen. complete antibody antibody capable of agglutinating cells in physiologic saline solution. cross-reacting antibody one that combines with an antigen other than the one that induced its production. cytotoxic antibody any specific antibody directed against cellular antigens, which when bound to the antigen, activates the complement pathway or activates killer cells, resulting in cell lysis. cytotropic antibody any of a class of antibodies that attach to tissue cells (such as mast cells and basophils) through their Fc segments to induce the release of histamine and other vasoconstrictive amines important in immediate hypersensitivity reactions. In humans this antibody, also known as reagin, is of the immunoglobulin class known as IgE. Called also cytophilic antibody. heterophil antibody a characteristic antibody found with many cases of infectious mononucleosis; see also heterophil antibody. immune antibody a type of isoantibody induced by immunization, either by pregnancy or by transfusion, in contrast to natural antibodies. 1. antibody that binds to erythrocytes or bacteria but does not produce agglutination; in blood banking, the nonagglutinating antibody is detectable in serum by using the antiglobulin (Coombs') test. For example, IgG anti-Rh antibodies do not agglutinate erythrocytes in physiologic saline whereas IgM antibodies do. 2. a univalent antibody fragment. monoclonal a's (MOAB) proteins produced from a single clone of B lymphocytes; used as laboratory reagents in radioimmunoassays, ELISA assay, and immunofluorescence assays, and also as biological response modifiers fused with rapidly reproducing myeloma cells, resulting in a hybridoma capable of synthesizing a massive amount of one specific antibody; the antibody is made in response to tumor cells injected into mice and is produced from mouse serum. Monoclonal antibodies may be used alone (unconjugated) or bound (conjugated) to radioisotopes, toxins, or other biological response modifiers. When bound to radioisotopes they may also be used as a diagnostic tool to locate tumors and metastatic disease. natural a's (naturally occurring a's) antibodies present in the serum of normal individuals in the apparent absence of any contact with the specific antigen, probably induced by exposure to cross-reacting antigens; examples are the ABO antibodies, anti-A and anti-B. Such antibodies may play a major role in resistance to infection. neutralizing antibody one that reduces or destroys infectivity of a homologous infectious agent by partial or complete destruction of the agent. protective antibody one responsible for immunity to an infectious agent, observed in passive immunity. Rh a's those directed against Rh antigen(s) of human erythrocytes. Not normally present, they may be produced when Rh-negative persons receive Rh-positive blood by transfusion or when an Rh-negative person is pregnant with an Rh-positive fetus. specialized serum proteins produced by B lymphocytes in response to an immense number of different antigens (>107) to which an animal may be exposed. Antibody produced by a particular antigen combines with that antigen only. The exquisite specificity of Ab for the antigen that stimulated its production is the basis for all antibody-antigen reactions both in vivo and in vitro. Antibodies are heterodimers composed of two light (L) and two heavy (H) chain polypeptide molecules. The amino termini of the L and H chains have a variable amino acid sequence VL and VH. The specificity of Ab for Ag is conferred by the VL and VH domains. There are five major classes of antibody, designated IgG, IgM, IgA, IgD and IgE. Abbreviated Ab or Ig. Called also immunoglubulin or gamma globulin. See also immunity. antibody, usually IgE, formed after the first injection of certain allergens and responsible for the signs of anaphylaxis following subsequent exposures to the same allergen. the specific combination of antigen with homologous antibody resulting in the reversible formation of antibody-antigen complexes that differ in composition according to the antibody-antigen ratio. See also antigen. autoantibodies directed against components of the cell nucleus, e.g. DNA, RNA and histones; they may be detected by immunofluorescence. A positive ANA test is characteristic of systemic lupus erythematosus, Sjögren's syndrome and rheumatoid arthritis. antibodies against the antibody variable region. those produced against an immunoglobulin, often used as reagents to study immunoglobulin molecules. produced following entry of sperm into the bloodstream, e.g. following rupture of the epididymis as in Brucella ovis infections. circulating antibody (usually IgG) that reacts preferentially with an antigen, preventing it from reacting with a cell-bound antibody (IgE) and blocking the induction of anaphylaxis. immunoglobulins of the IgG or IgM class which bind complement. one that combines with an antigen other than, but structurally related to, the one that induced its production. that which binds antigens expressed on the cell surface, which may (a) activate the complement pathway or (b) activate killer cells, resulting in cell lysis. those that attach to tissue cells (such as IgE to mast cells and basophils) that have an Fc receptor. a cytotoxic reaction in which nonsensitized cells bearing Fc receptors recognize target cells that have antibody bound to antigen exposed in the cell membrane of the target cell. one with greater affinity for an antigen other than the one that stimulated its formation. has been investigated mostly as a means of controlling fertility in animals. See also contraception. one induced by immunization or by transfusion incompatibility, in contrast to natural antibodies. an antibody which combines with antigen without producing an observable reaction such as agglutination; originally used to describe Rh antibodies. those passively transferred from dam to fetus or neonate, transplacentally or via colostrum or yolk sac. See also passive immunity. damage to cells, especially erythrocytes, caused by the reaction of antibodies (IgG, IgM or IgA) with cell surface antigens. ones that react with antigens to which the individual has had no known exposure. The best examples are anti a and b antibodies present in serum of humans of blood group B and A, respectively. one that reduces, destroys or blocks infectivity of an infectious agent, particularly virus, by partial or complete destruction of the agent. a collection of immunoglobulins that react against the same or different antigenic determinants of the one antigen molecule. one responsible for immunity to an infectious agent. see reagin and immunoglobulin E.
all the antibody specificities that can be produced by an individual. having a deleterious effect upon cells. generally refers to those used in chemotherapy of neoplasms, e.g. cyclophosphamide, vincristine, etc.